Dr Paloma Arroyo Huidobro holds a PhD in Condensed Matter Theory from Universidad Autónoma de Madrid (Spain). She joined Imperial College in November 2014, where she is a Marie-Sklodowska Curie Fellow since May 2016. 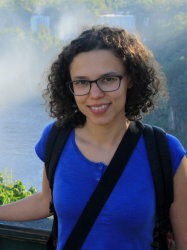 Her research focuses on the interaction between light and matter, including the following topics: plasmonics and nanoantennas, graphene plasmonics, quantum plasmonics, metamaterials and metasurfaces, and transformation optics. Dr Arroyo Huidobro's publications can be found in the above tab or in her Google Scholar profile.